Geraldton Dog Rescue is run by volunteers, and is designed to rehome suitable dogs from the City of Greater Geraldton’s dog pound. If unclaimed, dogs deemed suitable for rehoming are taken from the pound. They are bathed, have a veterinary check and treatments as required. They are then placed in a “foster home” whilst a permanent home is found for them. All kinds of dogs become available for rehoming: small/large; short/long hair; bitsers/pedigrees; puppies/older dogs; male/female. Consider visiting Geraldton Dog Rescue before you go to a pet shop or breeder. A new permanent owner will be required to pay from $400 to the program before the dog is handed over. This fee covers the cost of vet check, vaccination, microchip, worming, flea treatment and sterilisation. All dogs are to be registered with the Local Council prior to collection from Geraldton Dog Rescue. Please go to the Adoption page for more details. Please send us recent photos and a short description of how your new “best friend” is enjoying their new home. Your precious dog will have a starring role on our website in our Testimonials. Donations of dog food, toys, collars or leashes are always welcome. Please visit our Donations page for more information. Purchase your new dog tag through Geraldton Dog Rescue’s website to help support our goal of rescuing as many dogs in Geraldton as possible. We have 2 sizes available – 25mm or 32mm, and 5 different colours to choose from – Black, Blue, Gold, Purple and Red. 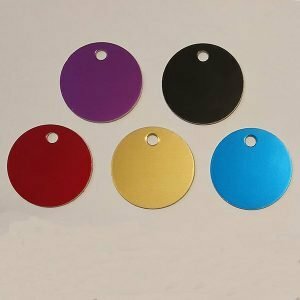 We offer FREE engraving for any dog tags purchased through Geraldton Dog Rescue and delivery is only $2 Australia wide. Buy your dog tag today to support Geraldton Dog Rescue.